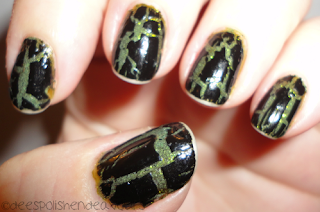 I had worn CG Zombie Zest with OPI Black Shatter for the Skrillex show on Tuesday evening.. And it actually held out until today.. Then, once I returned home from work I realized I had pulled a 'derp' move and never took a photo. The only reason I am sharing this is because I actually think it is a great combo! Halloween-ish, while not going over the top. A "safe bet", if you will. AND! One more day to enter my little giveaway.. I cannot believe the response to it - you're all awesome for entering AND for actually reading what I wrote and telling me what you like (or don't like) about my personal favourite month: October. I cannot wait to find out who the winner is!! Annnd I should also be painting my nails tomorrow as well. I'm hoping that I will actually do a good job.. Unlike the fail job I did with my Freddy Kruger nails - yikes! EDIT: I ended up buying an extra set of Revlon polishes as a bonus due to the volume of people entering the giveaway. I got the 2 winners via random.org on Friday (ok, Saturday at 12:05am) and e-mailed them. No response from either winner.. SO.. I have used random.org again to select two people - I am e-mailing them right now.. Hopefully I will hear back from these two so I can send off these gems!